Apple on Friday pulled all Withings products from its virtual and brick-and-mortar stores amid an escalating patent kerfuffle with the accessory maker's parent company Nokia. When Apple ceased Withings sales is unclear, but devices made by the Nokia subsidiary are no longer listed on Apple's website. Previously, Apple carried a wide range of iOS-compatible Withings devices in its retail stores, including the Body Cardio Scale and Wireless Blood Pressure Monitor. 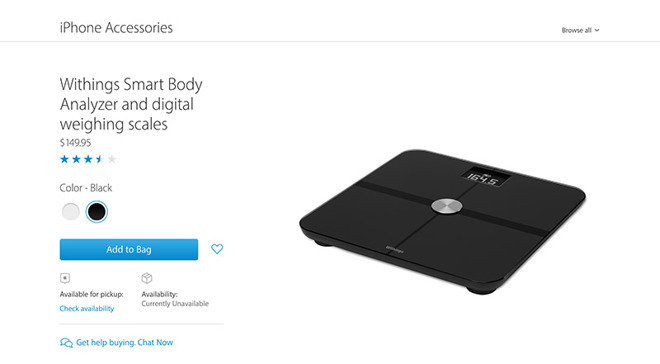 Apple also expunged all mention of Withings and its product line from the Apple.com online retail database. A quick check shows text autofill no longer identifies "Withings," "Body Cardio Scale," "Wireless Blood Pressure Monitor" or "Smart Body Analyzer," all products that were in the system prior to the abrupt policy change. Withings, a French firm specializing in health-related connected accessories, enjoyed happy —and lucrative —retail alliance with Apple for more than two years. While competing Withings products like the Steel smartwatch remained off-limits, most of the firm's iOS-compatible products did end up displayed on brick-and-mortar Apple store shelves. Product sales continued after the company was purchased by beleaguered cellphone giant Nokia in April for $192 million. However, a recent salvo of patent lawsuits seems to have soured the relationship. On Wednesday, Nokia filed suit against Apple in Germany and the U.S., accusing the iPhone maker of violating 32 patents acquired in portfolio purchases in 2013 and 2016. Apple fired back with its own lawsuit against nine patent holdings firms and Nokia itself, claiming the NPEs are working with Nokia to "extract and extort exorbitant revenues" from Apple and other manufacturers. In response, Nokia on Thursday launched a second salvo of patent-related legal actions against Apple. In all, Nokia is claiming infringement of 40 patents in lawsuits spanning across 11 countries. Whether or not the recent Withings removal is related to Nokia's shady legal dealings has yet to be confirmed, but Apple has in the past used its retail might as a retaliatory weapon. For example, Bose found its speakers and headphones vanquished from Apple store shelves in 2014 after the audio device manufacturer sued Beats over noise-cancelling patents. Bose products made a return two months later.